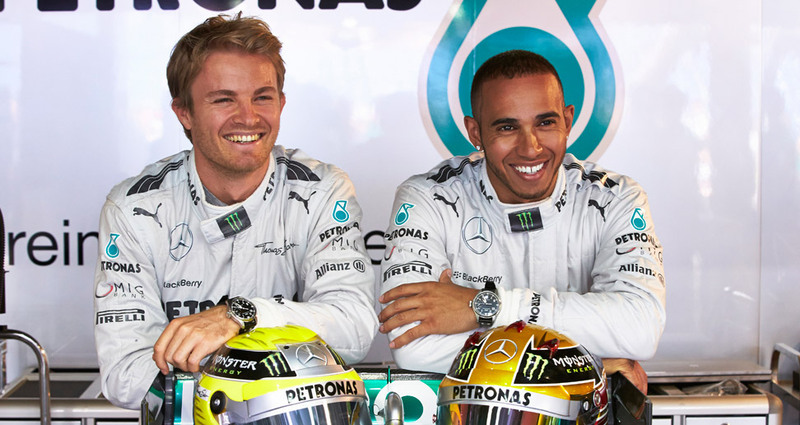 News: Lewis Hamilton and Nico Rosberg, New IWC Ambassadors. This past weekend at the Formula One Grand Prix of Monaco, IWC announced the appointment of two new prominent brand ambassadors: Lewis Hamilton and Nico Rosberg of the Mercedes AMG Petronas Formula One Team. The Swiss watch manufacturer became the Official Engineering Partner to the Mercedes AMG Petronas team earlier this year. IWC and Mercedes-Benz AMG entered into a special agreement almost ten years ago, in 2004. It was a venture between two companies with a long and successful history in precision engineering, founded on a shared commitment to pushing back the boundaries of mechanics and high technology. IWC’s appointment as Official Engineering Partner to the Mercedes AMG Petronas Formula One Team this year, was confirmation of the close ties between the two companies. Now, in a move that will further cement the partnership between the luxury watch manufacturer and the racing team, the two drivers Lewis Hamilton and Nico Rosberg have become 'Friends of the Brand'. Both of them watch enthusiasts, were presented with IWC Big Pilots watches by Goris Verburg, Director Marketing & Communications at IWC. Posted on May 29, 2013 by Editor & Publisher and filed under IWC, News and tagged IWC Formula One Mercedes AMG Petronas Nico Rosberg Lewis Hamilton Goris Verburg Grand Prix of Monaco IWC Big Pilots.